Send Ferrero Rocher bouquet with Red Roses to Chennai. Gifts to Chennai. Send Chocolates to Chennai. 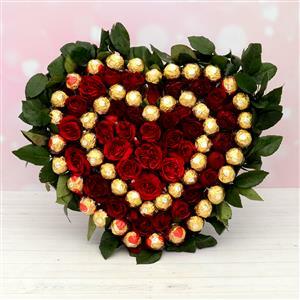 Description : 48 Pcs Ferrero Rocher & 35 Pcs Red Roses Bouquet - This beautiful bouquet of chocolates is perfect to be sent as gifts to your friends and family. They will especially love the fact that the chocolates are in the form of a bouquet.